Just like Obi-Wan Kenobi messing with minds using the force, allowing null values in database fields can lead to undesired behavior. Null values really aren’t a ‘value’…they are an absence of value. They act more like a field state than a referenceable value. This can lead to interesting behavior when querying a field based on value. Depending on what you were expecting there is a wide variance between the two result sets. When creating database tables one must take great care to decide if NULL should be allowed and if not allowed then what the default value should be. When querying a table that has fields that allow NULL values one must take care of how they reference that value in the query to ensure that the right response is returned. Null values can be a valuable characteristic when referencing data but they can have undesirable consequences when not use appropriately. Designing Search is a very interesting and compelling treatise on the complexities of designing a search interface. The first chapter alone, Starting from Zero, is well worth the price of admission…if for no other reason than it opens one’s mind to the possibilities, complexities, and land mines that lie in wait for the uninitiated. 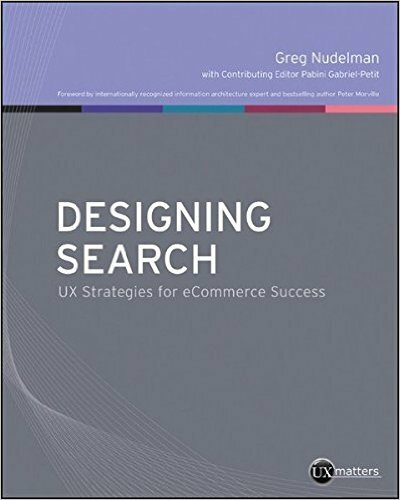 The book is broken out into three sections: Optimizing eCommerce Search Results, Designing Search eCommerce Interactions, & The Future of eCommerce Search. Each section does a good job of covering the intended subject while at the same time illuminating how difficult it is to to search really well. At the end of each section I looked back to how much I had learned yet I was left with how much more there is to learn, specifically about the search implementation that I’m currently working on. Some of the best points that the book makes are with the importance of understanding the patterns and models of information seeking that exist with customers, searching, and the interaction between the two. In addition to the importance, the book also provides a decent domain pattern language that will quickly add the words ‘pogo sticking’, ‘thrashing’, ‘berry picking’ & ‘pearl growing’ to your daily lexicon. The book also includes a fair number of insights from other authors and practitioners as well as a pretty good set of references for each chapter. It’s almost like this book is a gateway drug for Search…as it will change how you think, view, and interact with search forever more (and in my case caused me to queue up a fair number of other tomes on the subject for my next reading). It’s a very good book, well written in an easy-to-read manner that encourages re-reading sections for more enlightenment. The author also has a pretty good website, www.designcaffeine.com, where there are more resources on UX, design, etc. KPI, Productivity Metrics, & Rock Fetches…oh my!